As l promised in my last post, here is a recipe for the Naan bread. The word naan means flat bread in it’s original Persian. The one I made is a Punjabi Naan. It is not as common in India as we tend to believe and originates from northern India, especially Kashmir and Punjab. I took the recipe from «The Australian Weekly Magazine» and this version is for the home oven. 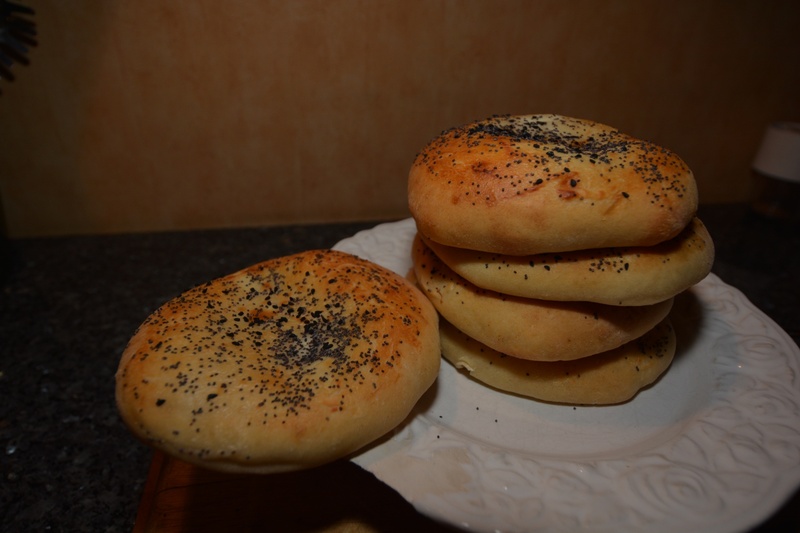 Traditionally they bake it in a tandoor clay oven that arrives at high temperatures. This gives the characteristically bubbly appearance. You can simulate this by putting the dough on a hot, cast iron frying pan. Then you skip the yogurt topping. 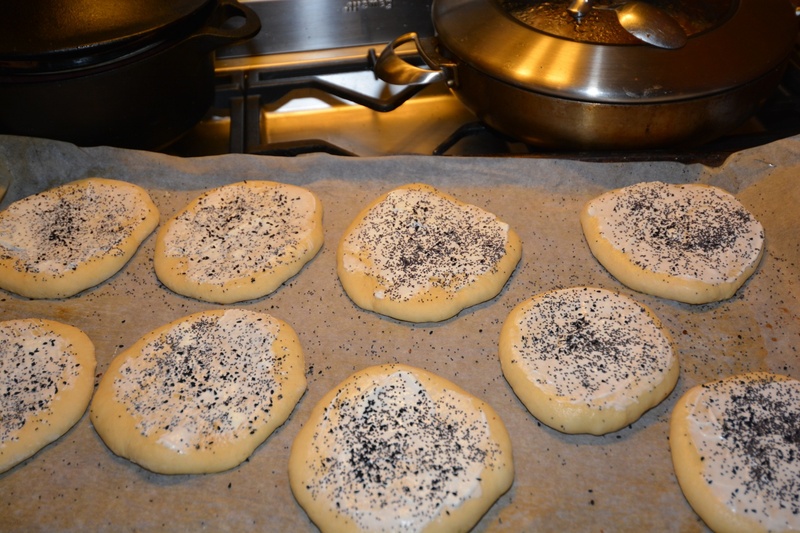 Do as follows; wet the dough on one side and spread some butter, sesam, poppy or nigella seeds on the other. Put the wet side on the warm pan, cover with a lid and wait until bubbles appear on the top. Put the top, bubbly side over a flame to give it the typical charred appearance. Usually naan are more flat than on the picture. It’s easy to prepare, hard to resist and can accompany lot’s of different dishes. This recipe has a velvety, soft texture and is coated with yogurt, poppy and nigella seeds. You can use white flour or partly whole wheat flour. 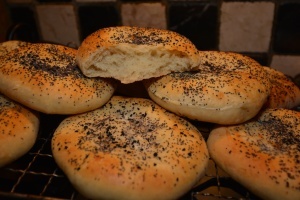 You can also use a strong flour with higher gluten content for the characteristic chewy, elastic texture. It’s is often served with various curry dishes and dal. The recipe is enough for 8-10 pieces. Combine yeast, sugar, water and 1/2 cup of the flour in a small bowl. Stir until smooth. Cover and let stand in a warm place for 10 minutes until foamy. Shift remaining flour and extra sugar into large bowl making a well in center. Pour yeast mixture into the dry ingredients. Stir in yogurt, extra water, cumin, egg, gee or oil and salt. 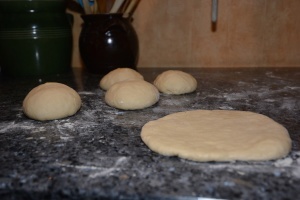 Knead by hand or machine for 7 minutes until dough is smooth and elastic. Place into a lightly oiled, large bowl. Let stand until doubled in size, about 45 minutes. Move it into a surface and divide into 8-10 portions. Roll into balls, cover and let stand for 5 minutes. Roll on a lightly floured surface and flatten to rounds about 15 cm. Spread extra yogurt over each round. 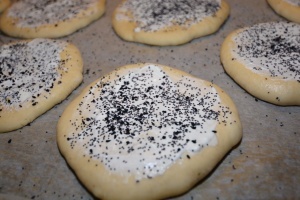 Sprinkle with poppy seeds and nigella. Move into tray with baking paper and let it stay for another 5 minutes. 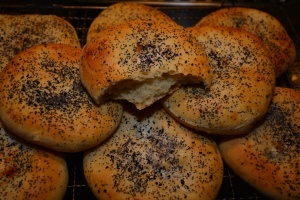 Bake on moderately hot oven for 12 minutes or until brown and crisp. This can be fun and you can activate the whole family in the process. From the stages of preparation to the sharing of magic moments around the table. Thanks for your encouraging and warm words. I promise there is more yet to come.. Hope to hear from you again.